Powers/Abilities: Sinbad possessed the normal human strength level of a man of size, height and build who engages in extensive exercises. He had no superhuman powers, but he was a brilliant sailor and seaman of extraordinary sea-faring fortitude and a capable warrior with a sword capable of using his wiles to escape virtually any obstacle. He had a self-professed "silver tongue" and had a limited knowlege of sorcery. History: (Thousand and One Nights) - Sinbad was born in Sur, Oman during the Abbassid Dynasty of Baghdad during the Late Eighth Century. He lived at the same time as King Mihrjan (Caliph Harun al-Rashid) of Baghdad who ruled from 766 to 809 AD and exchanged gifts with King Charlemagne of the Franks during his wars with the Byzantine Empire. As a child, Sinbad had inherited a great deal of money from his merchant father, but he squandered most of it in his youth and used what little was left of it as an adult to buy goods and join a company of merchants heading to sea. In the first of his seven voyages, Sinbad was among the sailors as they dropped anchor on an island they discovered out at sea. They landed to claim the property, but the land mass turned out to be a sleeping great whale awakened by the campfire they had set and it once again dived into the sea. Sinbad and his allies were thrown into the sea as a result, and he was left to drift back to Baghdad where King Mihrjan appointed him harbormaster. Eventually, Sinbad found a ship heading to his homeland and booked a passage home. Bored with life on land, Sinbad joined a larger band of merchants heading to sea for his second voyage. They eventually reached Sri Lanka where they stopped for water, but Sinbad wandered off to explore the island a fell asleep far from the beach. His kinsman left him behind, but Sinbad eventually found the nest of a giant bird called a rukh (roc) which was so large that it fed elephants to its young. Sinbad lashed itself to its leg for transportation and was carried off to a large hill where he found a cache of diamonds. Descending the hill with the diamonds, he had to pass through the Valley of Serpents filled with dragons and survived. He waited until more merchants landed on the island and he booked passage to Basra before being returned home. Though wealthy now beyond his means, Sinbad longed for adventure and took his third voyage in the company of more merchants, but their voyage was blown off course toward Malacca Island near Sumatra. At the Mountain of the Zughb, they encountered the Zughb, a race of apelike creatures, who stole their ship and left the men stranded to be taken captive by a giant ogre that lived on the island. The ogre called upon two monsters to kill the men but roasted two of the survivors on a spit and ate them, but Sinbad lead the other survivors in using heated pokers to blind the giant as he slept. Sinbad also encountered a giant serpent who ate several more of his men as he escaped. Saving himself by hiding inside an enclosure, Sinbad made it back to shore where he eventually alerted another passing ship to rescue him. Forgetting his perils and hardships, Sinbad headed out to sea on his fourth voyage with another band of merchants and they landed at an Isle of Cannibals near Sumatra. All of the merchants were slaughtered for food, but again, Sinbad escaped by eating as little while his kinsmen were fattened up and made his way to an unidentified city of civilized people and lived among them for a while. He became wealthy by creating and selling bridles and stirrups to the people who never had such things. The dying king gave his daughter of high pedigree to Sinbad, but when she died, Sinbad was required as per their custom to be entombed with her among the dead. Sinbad was sealed within a deep cave with the body of his dead wife, but fortunately, a wild pig had wandered into the cave and he was able to follow it out to freedom. Rich from rifling through the treasures of the tomb, Sinbad escaped and alerted another ship, once again reach home. Sinbad soon headed out to sea on his fifth voyage with another group of merchants and they headed to the land of the rukh to search for riches. They instead discovered the nest of the rukh and broke open its large egg, killing the unborn chick for meat. The parents of the infant rukh following the scent of their murdered off-spring followed the merchants back to their ship and destroyed it by dropping boulders on it. Sinbad again survived and drifted off to the Isle of Shaykh al-Bahr near Sumatra where he encountered Shaykh al-Bahr, the Old Man of the Sea. The frail man asked Sinbad to carry him across a channel, but Sinbad did not know the man rode the shoulders of men until their deaths, never letting go. For days, Sinbad carried the man on his shoulders as he slept and relieved himself on him. Finally, Sinbad got the man drunk and smashed his head with a rock. Again, he escaped the island with the help of another passing ship. On his fifth adventure, Sinbad instead traveled by land to India and set sail with a ship's captain he met there, but their voyage was marred by a storm and dashed upon rocks that once again left Sinbad shipwrecked on a barren island near Sri Lanka (modern Ceylon). He built a raft and journeyed up-river to the city of Serendib in the shadow of a mountain. The monarch welcomed Sinbad as his guest, but Sinbad explored the mountain and discovered a treasure of rubies and diamonds. The monarch granted Sinbad gifts to take to the caliph in Baghdad and a ship to reach home. (Fantastic 4th Voyage of Sinbad (fb)-BTS) - At some point, Sinbad was transformed into a monstrous being. During this time he met a woman who saw through his hideous exterior and fell in love with the man beneath. He was cured and she would bear his child, Dione. (Official Handbook of the Marvel Universe Update '89#3: Genosha entry) - At some point, it was rumored that Sinbad visited the island of Genosha, some time before westerners began to expand their empires into Africa and Southeast Asia. 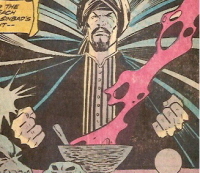 (Marvel Spotlight I#25 (fb)-BTS) - Sinbad and his crew were sent to Chandra to negotiate peace between it and Baghdad. He was successful, and even met and became engaged to Chandra's Princess Parisa while there. (Marvel Spotlight I#25 (fb)) - As Sinbad's ship sailed out of Chandra, they were hit by a storm. With their supplies depleted, the landed on the first island they found, which turned out to be Colossa, home of the Cyclops. They witnessed Sokurah run out of a cave begging for help as a Cyclops chased him. 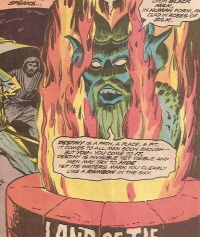 As Sinbad and his crew battled the Cyclops, Sokurah called forth a Genie from a magic lamp and ordered the Genie to protect the men from the monster. The Genie created a wall of energy and the men escaped to their ship, with Sokurah in tow. However, the Cyclops threw a boulder which shook the ship and caused Sokurah to drop the Genie's lamp back onto land, where the Cyclops took possession of it. (Marvel Spotlight I#25) - Sinbad returnred to Baghdad and just as he began to introduce his bride-to-be, Princess Parisa, to the Caliph, Sokurah arrived seeking an audience with the Caliph, but the Caliph was more interested in Sinbad's adventures. Sinbad explained Sokurah's role in their rescue, and the Caliph granted the magician an audience. Sokurah requested to return to Colossa for his lamp, but the Caliph refused, noting the cost and crew it would take. Sokurah performed a propechy for the Caliph, sighting a renewed war between Baghdad and Chandra. Incensed, the Caliph had Sokurah thrown out of the palace. That night, Sokurah cast a spell that reduced Princess Parisa to the size of a doll. He then told Sinbad that he would restore her only if Sinbad aided him in recovering his lamp. As added incentive, he told Sinbad that the only cure for Parisa included a piece of the shell of the monstrous Roc. With no other choice, Sinbad agreed. His crew scattered and decimated by the previous trip, Sinbad had no choice but to recruit a group of prisoners, offering them an alternative to their eventual executions. The leader of the prisoners, Kharim, agreed, though he secretly plotted against Sinbad. Hoping to turn the ship into a pirate vessel, Kharim led a mutiny, imprisoning Sinbad, Sinbad's first mate Harufa and Sokurah. As the crew sailed past the Island of the Sirens, the Sirens cries caused Kharim to go insane and leap to his death. The mutiny squelched - as the others were not wishing their own demises - Sinbad retook the ship and continued on to Colossa. The crew prepared a giant crossbow on the beach and then ventured inland to find the Roc's nest. Instead, they came across a Cyclops cave, filled with treasures. The Cyclops arrived and attacked the crew, imprisoning them in a cage, though Sokurah escaped and ran further into the cave to search for his lamp. Trapped, Sinbad produced a box, which Parisa was in. The shrunken princess then undid the cage's latch, releasing the men. Sinbad then led the Cyclops to a cliff, where it fell to its death. Sinbad then found the lamp. The crew then began the search again for the Roc's nest, and finding it, were overcome by hunger (it had taken them five days since the encounter with the Cyclops to make it to the nest) and broke a Roc egg open. A two-headed Roc bird emerged and was quickly killed before being cooked and consumed. Sinbad sent Sokurah away to use the egg shell to cure Parisa, but not trusting the wizard, he also had Parisa, who was small enough to enter the Genie's lamp, go into the magic item to learn its secrets. There, the genie introduced himself to her as Barani and told her how to control the lamp. Just then, a full-sized Roc attacked, giving Sokurah the chance to kidnap Parisa. Sinbad and Barani found Sokurah's lair on the island and entered it, only to be confronted by a dragon. Making their way past it, they found Sokurah. He returned Parisa to her natural size and demanded the lamp, but Sinbad was leary. The incensed Sokurah then raised an animated skeleton to battle the sailor. Sinbad defeated the undead being and with Parisa ran to escape the wizard's lair. As they passed over a sea of lava, Parisa begged Sinbad to drop the lamp into the lava, explaining to him that its destruction there would free Barani. Sokurah released the dragon to go after Sinbad and Sinbad used the giant crossbow to kill the dragon. It fell over, crushing Sokurah to death. Sinbad, Parisa and the crew then set sail back to Baghdad. Sinbad mourned Barani, who revealed he was not dead, but rather, free from the lamp and now a real human (taking on the role of Sinbad's cabin boy). Barani then presented Sinbad and Parisa with a room full of the Cyclops' treasures - a wedding gift to them. (Worlds Uknown#7) - Years later, Sinbad sailed with a new crew. As they spied a strange creatures flying above them, one crewmember shot an arrow at it, causing it to drop a golden amulet. Sinbad picked it up, only to be struck by the creature before it flew off. Sinbad's crewmate Rachid begged Sinbad to throw the amulet overboard, believing it to be an evil omen, but Sinbad refused, having seen a vision of a beautiful woman while holding it. Sinbad had awful visions in his sleep that night, and awoke to a terrible storm. Taking the till, Sinbad managed to sail through the storm, but it swept the ship off course, taking it to the land known as Marabia. Leaving his crew to dock, Sinbad swam to the shore, where he was attacked by Prince Koura and Koura's henchman Achmed, who pursued the amulet. Sinbad stole one of their horses and rode it into town, where he encountered the golden-masked Grand Vizier. He pleaded for help from the Vizier, who assured Sinbad he had it. The Vizier led Sinbad to an underground tomb where he explained the Koura was trying to conquer Marabia with the aid of the amulet, which was actually one of a pair. Koura's bat-like humanoid creature, the same that dropped the amulet originally, attacked Sinbad. Sinbad grabbed it, but it crumbled into dust, already transmitting its knowledge to a duplicate being held by Koura. That night, Sinbad was approached by Hakim, who offered Sinbad hundreds of gold coins in exchange for taking Hakim's lazy son Haroun on the seas with him. Sinbad declined at first, but when Hakim's servant girl Margiana came into the room, Sinbad realized she was the girl from his vision. Seeing his opportunity, Hakim then offered Sinbad both Margiana and four hundred gold coins if he took Haroun with him as well. The crew, with Margiana, Haroun and the Grand Vizier in tow, set sail, hoping to find the lost continent of Lemuria. Margiana tried to serve Sinbad, who bid her a slave no longer. He also realized Koura was following in a ship of his own. Sinbad led Koura through the Sea of Mists, known for its rough terrain and deadly rocks, as Sinbad had sailed through it once before and knew the course. 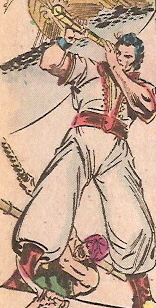 Koura used mystic powers to bring the siren figurehead of Sinbad's ship to life and it attacked the crew before stealing Sinbad's charts and falling overboard. It was retrieved by Koura, who now had the maps to follow Sinbad. (Worlds Uknown#8 (fb)) - Sinbad and his crew found Lemuria and the Temple of the Oracle that was erected upon its shore. They entered the temple. (Worlds Unknown#8) - The Oracle prophecized to Sinbad, revealing there was a third part of the amulet/tablet. While trailing Sinbad on the island, Koura and Achmed were surrounded by green-skinned humanoids and then by Sinbad and his men. Cornered, Koura brought to life a nearby statue of the six-armed goddess Caro. The stature murdered Sinbad's crewmate Hassim and knocked Rachid and Abdul unconscious before Sinbad and Haroun knocked it over and shattered it, revealing the third amulet hidden inside. Koura convinced the Green Men that Sinbad had killed their goddess and they attacked him. Margiana tried to stop them but when they saw the tattoo of an eye on her hand, they took her captive to sacrfice to another of their gods, a centaur. The remaining Green Men restrained Sinbad, but he made the Vizier remove his mask, unveiling his horribly deformed face which shocked the Green Men and caused them to loosen their grip on the sailor. He followed Koura, who was using the amulets in a mystic Fountain of Destiny to regain youth and power and currently had Margiana captive, but Koura sent the centaur to attack him, only for the creature to be felled by Sinbad's blade. While bathing in the fountain's waters, Koura attempted to strke Sinbad but was himself slain. As he fell below the waters, the magic of the amulets brought fourth a crow to the water's surface. Realizing that it belonged to one who would be king - and not wishing to be one himself - Sinbad placed it on the Vizier's head, magically restoring his pre-scarred appearance. The next morning, Sinbad, Margiana and the crew set sail back to Marabia and after that, new adventures. (Fantastic 4th Voyage of Sinbad (fb)-BTS) - Jihad took Sinbad's daughter Dione captive in order to force the sailor to help him locate four mystic items. With his limited knowledge of sorcery, Sinbad agreed and searched for aid, finding it centuries - possibly a world away - before he was transformed into a wooden statue by Jihad. (Fantastic 4th Voyage of Sinbad) - On present-day Earth-616 (see comments), the Fantastic Four were attacked by beings that seemed to be composed of a fog that had swept across New York City. Defeating the fog-beings, the group ran to see about the safety of Mr. Fantastic and Invisible Woman's children, to find them and Caledonia battling a Hydra. Before they could save the kids, Jihad made his presence known and transported all seven to Sinbad's dromond (ship). On the seemingly-deserted ship, the FF, the Richards children and their ally Caledonia found charts in Arabic, which Valeria translated, which is how they learned it belonged to Sinbad. Unknown to them, Sinbad himself was now part of the ship as its wooden figurehead. They also learned they were being sent on a quest to locate four magical items (a giant gem called the All-Seeing Eye, the Mallet of Destiny, the Crystal Casque and the Gauntlets of Forever). Sailing the boat in search of the first item - a crystal casque, they came upon a floating city of crystal and the Invisible Woman used her powers to recover the casque from it. They next ventured to a land where a caliph (presumably not the same one from Baghdad) offered a pair of guantlets - the second item(s) as the prize in a game of literal human chess, which Reed beat him at. They then recovered the Mallet of Destiny from the lair of Iblis, a demon-goddess whose gaze could transform others into reptilian beings or stone. While searching for the fourth item - the All-Seeing Eye they and the ship were attacked by a gigantic Rukh, which captured the Human Torch and took it to the island it nested on, which also happened to contain the "eye," which was a huge crystal in the forehead of a giant stature of Khali (or Caro - see comments). They then witnessed Sinbad's ship transform into Jihad, who commended their efforts and demanded they turn over the items, as he had the children captive and turned into wooden statues. The Thing tried to rescue the transformed kids, but only managed to grab the figurehead statue from the "ship." Jihad then teleported away with the children and the mystic items. After his departure, the figurehead transformed back to human, revealing itself as Sinbad. The Fantastic Four and Sinbad then captured a Rukh and forced it to fly them to a city of many names that existed within many worlds. This city - now conquered and broken by the powerful Jihad - was a gateway to other worlds and Jihad planned to use it as his base to conquer them all. 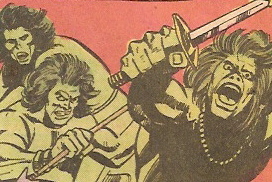 Sinbad and his new allies arrived and assaulted Jihad and his monkey-humanoid minions, temporarily defeating him. He returned, but wasn't in time, as the Thing used the Hammer of Destiny to crush the Crystal Casque. This returned the children - the Richards' and Sinbad's daughter Dione - to life and sent Jihad across the dimensional planes. Successful, Sinbad then sailed his real ship through the mystic fogs, which transported the group back to waters just off Manhattan. Sinbad admitted a bond to the Thing, as he too had once been trapped in a monstrous form for a time. Dropping his allies off, Sinbad and Dione then sailed back into the fogs and their own magical world. (A Thousand and One Nights) - By now, Sinbad had tired of adventure, but King Mihrjan encouraged him to travel back to Serendib with return gifts and he obliged. Sinbad never finished the sixth voyage as his ship was attacked by pirates who sold him as a slave to a rich merchant on Sri Lanka. The merchant took him on trips to hunt elephants for their tusks, and were so successful that after two months that they were lead by the elephants to an elephant graveyard that they might harvest their needs without killing them. In gratitude for the discovery, the merchant awarded Sinbad his freedom and sent him on an ivory ship back to Baghdad. As an old man rich in fortune and wealth, Sinbad soon encountered Hindbad the Hammel complaining about how unfair life was to him while Sinbad lived a life of luxury. Sinbad told the jealous porter the story of his life and then gave him enough money to stop being a porter and be able to do what he wanted with his life. Sinbad is a character from A Thousand and One Nights, a tome of 264 tales of varying length compiled between 988-1011 AD ranging from short anecdotes to novellas of several hundred pages; Sinbad occurring through tales 536-566. According to legend, King Shahryar of Samarkand did not want a wife that would cheat on him and dispatched them by death on his wedding night, but one of his wives, Queen Scheherazade, delayed her murder by keeping him entertained by starting and delaying the tales of her ancestors over a thousand and and one nights. Impressed by her ingenuity, he granted her her life and kept her as his wife for the extent of his life. Other characters from the tales include Aladdin (tales 1704 to 1715) and Ali Baba (not in the original version, but added to the 1885 version). The stories of mixed Eastern and Arabian origin first appeared in Europe through Antoine Galland's Mille ey une Units in 1704, but they gained bigger prominence in Francis Burton's fifteen-volume Thousand and One Nights printed in 1885. In these early tales, he was known as Sindbad, but the first "d" was later dropped as the character was turned into an allegory for good and evil.The actual origins of Sinbad could date back to Ancient Greece and may even be derived from the voyages of Odysseus to which they share similarities. Sinbad has been played by Douglas Fairbanks Jr. Dale Robertson, Kerwin Mathews, Guy Williams, John Phillip Law, Patrick Wayne and Lou Ferrigno and literally dozens of others in various films and television shows over the decades. He also appears in quite a few other non-Marvel comic books including Fables, League of Extraordinary Gentlemen and others. Marvel adapted Golden Voyage of Sinbad (the second film of the Harryhausen trilogy) first, then went back and adapted the first (Seventh Voyage of Sinbad), though chronologically Seventh takes place first. 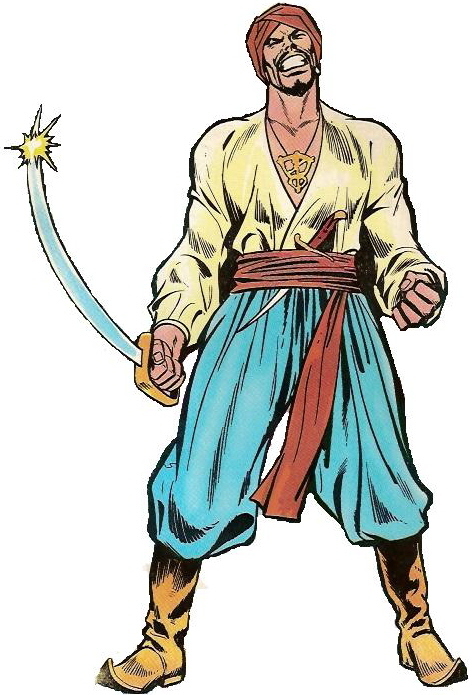 According to the book Adventure Heroes by Jeff Rovin, Sinbad was slated to appear in Contest of Champions I #1-3, but by then, their copyright to the character had run out and they renamed the character, who resembles actor John Phillip Law, The Arabian Knight. This can't be legit, though, as Sinbad as a character had long been in the public domain. Perhaps the chance was toyed with, but they opted to go with a Marvel-created character instead, but it definitely had nothing to do with copyright. 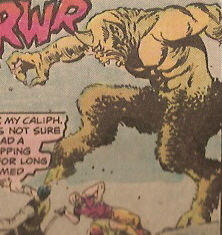 It can be presumed that the Caliph that appears in Marvel Spotlight is King Mihrjan from the original stories. Obviously, the Marvel adaptations of the Harryhausen stories - and the Harryhausen films themselves - don't really fit in perfectly with the orignal stories. Ray and his co-horts liked to take old stories, mix-and-match and add stuff from other myths to make their films even more exciting. As such, Sinbad's Marvel history should - for now - be relegated to only what we know and the historical aspects may differ greatly from his Marvel counterpart, hence all non-Marvel bits are kept in italics here. I placed all of his Marvel stuff between his known adventures and the end of his adventures, as they seemed to fit best there. It is unrevealed who Dione's mother is. It could be Princess Parisa, who we assume Sinbad married. It could be Magiana. It could be the deceased wife from the original stories who may be neither. It could be a completely separate character. It is very possible that he was turned into a monster during his peace-keeping trip to Chandra, met and fell in love with Parisa there, reverted to normal and then returned to Baghdad with her. I am ASSuming Parisa and Sinbad did get married shortly after we last see them together, though what became of her remains unrevealed. 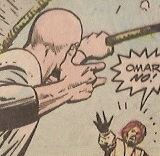 Okay - in Fantastic 4th Voyage, Sinbad lives in an alternate reality of magic. How does this figure into his being on Earth-616, as witnessed by his visit to Genosha? My theory is that he existed at first on Earth-616 and during his travels went through the mystic fogs, arriving in the world of magic where he opted to continue living, perhaps as an immortal with his culture and time never progressing. Enjoying this world of adventure more than the world he was born on, he opted to stay, with only occasional returns to Earth-616. OR: Perhaps Sinbad didn't quite understand time travel and the modern world, and assumed it was another reality, not his own a thousand or so years in the future. 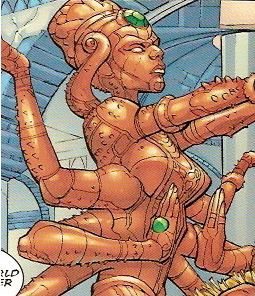 The six-armed goddess in the comic is called Caro. In the film, it was Khali. It's never named in Fantastic 4th Voyage, so it could be either (or Caro is just another name for Khali). There were many MANY other changes from the films to the comic versions, and the two should be considered separate realities instead of a condensed version of the other. Very VERY bad timing on the release of the Fantastic 4th Voyage book. It has an indicia date of September 2001 (though to be fair, that meant it hit shelves a couple of months before that) and a main villain named Jihad. Even the World Trade Center is referenced once in the book. Research culled from: World Mythology and Legend Volume II by Anthony Mercatante and James R. Dow, Adventure Heroes by Jeff Rovin and The Voyages of Sinbad article, National Geographic, July 1982.
anyone else with similar names. I am soooo not doing this for 30 more sub-profiles. Just assume none of them are to be confused with anyone else either. A mystic item that with three others could grant their user the power to traverse and conquer dimensions. A giant gem, it was located in the forehead of a giant statue. A magic genie, Barani resided in a lamp that Sokurah attempted to use for his own gain. After Sinbad destroyed the lamp in the lava running below Sokurah's lair, Barani was freed of his curse and became Sinbad's cabin boy. The Caliph of Baghdad. He sent Sinbad to Chandra to create peace between the two lands and welcomed the sailor home upon his return. He refused to send his men back to Colossa to recover Sokurah's lamp and then banished the wizard after Sokurah made a prophecy of Baghdad and Chandra resuming their war. 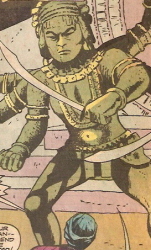 A resident of Lemuria, the "Green Men" tried to sacrifice Margiana to it before Sinbad killed the cyclopean creature. A mystic item that with three others could grant their user the power to traverse and conquer dimensions. It was originally housed in a floating city comprised of crystal. A giant satyr-like cyclops that resided on Colossa. It consumed shipwrecked sailors and attempted to do the same to Sinbad's crew. Sinbad killed it after tricking it into running off a cliff. 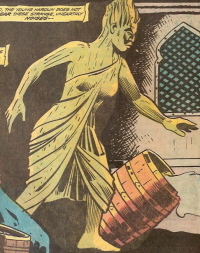 Sinbad's daughter, she was kidnapped by Jihad before being resuced by the Fantastic Four and her father. As a token, she gave the Thing an amulet that had led her father to her mother. The figurehead of Sinbad's ship, it was brought to "life" by Koura, who ordered it to steal the ship's charts. It did so and returned them to Koura. A fountain on the island of Lemuria, those who placed three golden amulets in it and then bathed in its waters would receive the gifts of Youth, Invincibility and a Crown of Many Riches. A mystic item that with three others could grant their user the power to traverse and conquer dimensions. Reed Richards won them from a caliph in a game of human chess. Loyal to the Sultan of Marabia, the Grand Vizier became the protector of his legacy upon his murder. Koura caused a fire that burned the Vizier's face horribly, leaving him to hide behind a gold mask. He accompanied Sinbad on his journey to Lemuria and once Koura was defeated, Sinbad gave the Vizier a crown bathed in the Fountain of Destiny, which restored his normal appearance. Savage tribe that resided on the island of Lemuria. They sided with Koura when he convinced them that Sinbad had killed their goddess Caro. Merchant who paid Sinbad 400 gold coins and his servant Margiana to take Hakim's son Haroun on his journey. Hakim's lazy son, his father paid Sinbad to take him with the crew on their journey to teach him how to be an adult. He became a trusted and valued member over time. A member of Sinbad's crew. A member of Sinbad's crew, he was killed by the Caro statue. Leader of a group of prisoners, Kharim agreed to be Sinbad's crew in his return to Colossa but rose a mutiny, hoping to use Sinbad's ship as a pirate vessel. When they came too close to the Island of the Sirens, Kharim went insane and drowned. Prince with mystic abilities who subjugated Marabia and followed Sinbad to Lemuria where he bathed in the Fountain of Destiny before being killed by Sinbad. An artificial being, the diminutive bat-creature served Koura as his eyes and ears from a distance. It was caught by Sinbad and crumbled into dust. A mystic item that with three others could grant their user the power to traverse and conquer dimensions. 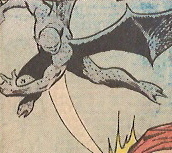 It was possessed by the demon-goddess Iblis before the Fantastic Four relieved her of it. Hakim's servant girl, she had a tattoo of an eye on the palm of her hand. After being given to Sinbad, he ordered her to stop taking orders and the two appeared to become romantically involved. A member of Sinbad's crew, he impulsely shot an arrow at Koura's bat-like creature, causing it to drop an amulet on Sinbad's ship. A mystic oracle on the island of Lemuria that aided Sinbad in his quest. A princess from Chandra, she fell in love with Sinbad during his visit there and he returned with her as his bride-to-be. A curse by Sokurah reduced to only a few inches tall, but he restored her later after Sinbad reluctantly helped the sorcerer recover his lamp. A member of Sinbad's crew, Rachid begged his captain to get rid of the amulet that had dropped upon their ship. A wizard who wished to use his magic lamp to force Barini to conquer, Sokurah tried to gain Sinbad's trust, but finally revealed his true intentions by placing a curse on Parisa. He forced Sinbad to help him return to Colossa to recover it, but was crushed to death by his dragon. 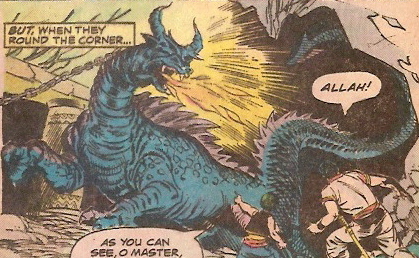 Sokurah kept a dragon chained to the entrance of his lair, but released it to go after Sinbad. When Sinbad killed it, it fell on Sokurah, crushing him.